Imagine a war that has hollowed the moon, seven skullrings that contain souls, a flying ship and a wall at the world's end. Imagine the unimaginable. From page one, this book thrusts you into the middle of two very different worlds. One where everything is ruled by steel. And another where time does not move forward. And a girl will risk everything to try to merge these worlds together. 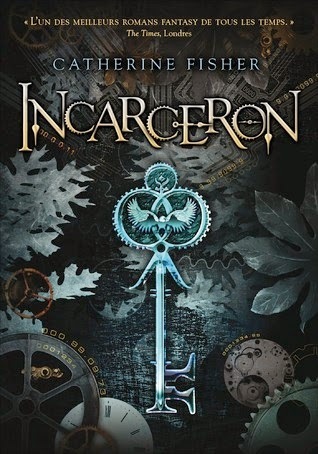 Finn is a member of a gang in Incarceron, a living prison. This prison is made of steel, but it keeps its occupants alive by recycling the living and its steel. But Finn has vague memories of Outside. He feels like he does not belong to Incarceron. Thus starts his journey to get out. Claudia is a spoiled girl living in a world bound by Protocol. Imagine if we all started using mannerisms and wearing clothes from the 1700s (a caste system if you will). Knowing there's another world out there and only those in power forcing the current social structure, Claudia works to remove this stop in time. But as she uncovers the secrets of Incarceron, people begin to reveal their motives which changes things for her. Honestly, the world building here is extravagant. However, I felt like there was a catch or an explanation that was going to come out soon revealing why things were the way they were. But I never got that explanation. Instead, I'm forced into a world that I don't understand. And jumping between the worlds, I began to think it was all a little silly. Don't get me wrong, the characters and the story is exceptional. I just wish I had that explanation to go with it. In the end, I'm left asking, "So what?" A beautiful world where the jail is alive and people are hidden from the truth. Even when you work to be free, you find you are still a prisoner, just in a different world. Fantasy lovers should give this new world a try.